Wanna Place A Bet? From Breweries To Symphonies, The Game Is On : The Two-Way After Super Bowl 50, will the Colorado Symphony Orchestra be playing "Sweet Caroline"? Or will a Charlotte, N.C., brewery employee be getting a Broncos-themed tattoo? This is Super Bowl coverage from NPR. Of course we'll seize the opportunity to use a photo of a symphony orchestra. But a few of the bets placed on Super Bowl 50 have at least a little bit more skin in the game. Govs. Pat McRory of North Carolina and John Hickenlooper of Colorado have dueling donation pledges, with the loser supporting the other state's needy. If the Panthers win, a North Carolina shelter will get 50 backpacks with school supplies and a food bank will get Coloradan cuisine: 50 cases of salsa, 500 boxes of crackers and 500 packages of sausages. If the Broncos emerge victorious, a Colorado food bank will get 50 cases of turkey burgers and 50 cases of turkey sausages from North Carolina's Butterball. Meanwhile the states' senators — Republicans Thom Tillis and Richard Burr from North Carolina, and Republican Cory Gardner and Democrat Michael Bennet from Colorado — have wagered a speech. The freshman senator from the losing state — that is, Tillis or Gardner — will congratulate the winning team and state, in great detail, on the Senate floor. And the symphony orchestras in both cities have — what else? — music on the line. In CSO vs. CSO (that's the Charlotte Symphony Orchestra and the Colorado Symphony Orchestra), the Coloradans have pledged to play Sweet Caroline if the Panthers win, and the North Carolinians will perform Hoe-Down from Aaron Copland's Rodeo. The symphonies announced the wager in a video that features two conductors named Christopher, inexplicable, barely-held-together British accents, Denver musicians chomping down on Fig Newtons (Newtons, get it? 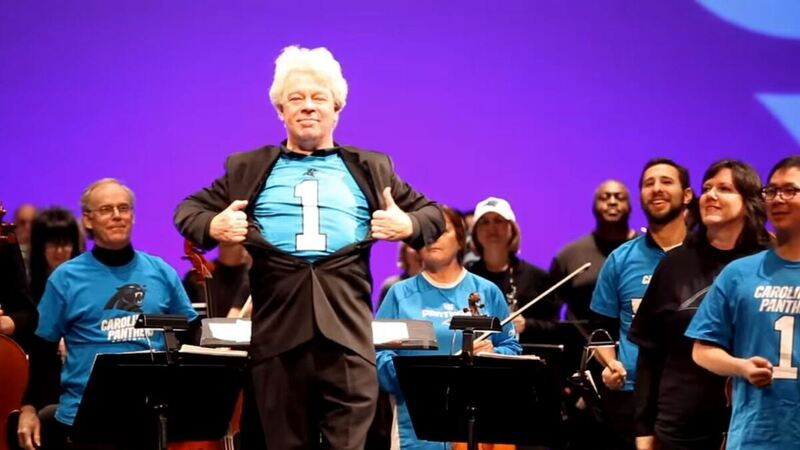 ), Carolina orchestra members mocking Peyton Manning's Nationwide ads and a very determined trumpet player wielding his instrument with a giant Panthers paw on. And an entire symphony orchestra doing the dab, of course. Denver's Spangalang Brewery and North Carolina's Fullsteam Brewery have a creative challenge: the losing brewery will concoct a batch of beer with ingredients indigenous to the winning team's state, and a name picked by the winner. Denver's Strange Craft Beer Company has a straight-forward face-off with Charlotte's NoDa Brewing — the loser will send the winner cases of their signature beers. Charlotte's Wooden Robot Brewery will face off with Little Machine Brewery in Denver — and can we just pause for a moment here to appreciate the fact that both Charlotte and Denver have a robot-themed brewery? Their stakes include an as-yet-undefined "physical challenge," to be conducted in either a Superman costume (should the Panthers win) or a Sheriff costume (if the Broncos triumph). Bonus points for picking quarterback alter egos instead of just jerseys! In a true sign of commitment, Triple C in Charlotte and CODA brewing in Denver have wagered tattoos. One employee at each brewery has pledged to get a tattoo honoring the opposing team should his own side lose. Colorado's Lone Tree Brewery and Charlotte's Sycamore Brewery have money on the line. A donation, that, is to a mascot-appropriate charity: Either the Colorado Horse Rescue or a panther rescue. And there are plenty of charitable "wagers" where no matter who wins, nonprofits in both cities get a boost. The local United Way charities are holding book drives where, they say, "our communities' kids come out as the champs." The Catholic charities from the two cities are holding a fundraising competition, with a target of $50,000 for Super Bowl 50. Rabbis in both cities are holding an online fundraiser, with 2/3 of proceeds to the victor's charity of choice and the rest to the loser's pick. They've dubbed it "Super Mitzvah 50," and released competing hype videos. "These are days when we celebrate God's chosen team — the Carolina Panthers," Rabbi Judy Schindler says. Temple Emanuel Denver went with a movie trailer approach, for a film called ... Broncos Vs. Kitty Cats. Wondering if the local public radio stations got into the spirit? Charlotte's WFAE was game for it, but Colorado Public Radio says they're "not the betting type."